Marc Jacobs (born in 1963) is an American designer creating men's and women's apparel, shoes, as well as clothing for children. There is more expensive and luxurious line of Marc Jacobs collection, more affordable Marc by Marc Jacobs line. Both brand lines have clothing, shoes, handbags, eyewear and the brand also has a great perfume line as well. Currently this talented American designer is also working for Louis Vuitton, where he in cooperation with Takeshi Murakami and Stephen Sprouse created one of the most successful handbag lines for the LV brand. He also designed the first Louis Vuitton clothing collection. 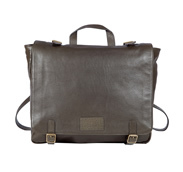 The black leather weekender bag for males is very urban, trendy and quite useful man bag. It can be used as a travel bag or as a comfortable daily handbag if you need to take some things with you. All of the Marc Jacobs man bags have been designed bearing in mind that the functionality is the key to a successful men's leather handbag. The style and looks are impeccable, and these men's tote bags and messenger bags have great functionality too. Masculine designs, no extra details, just simple and practical men's bags that can be carried by Wall Street broker in Manhattan or by a rock star in posh London club or just by anyone, who needs a black leather handbag. For example, there are quite few leather duffels can be also used as a gym bags and that will be quite handy in daily life. Let's have closer look at this backpack sold at Saks Fifth Avenue. This backpack is made of very fine leather. The emphasized zip closure adds more to the laconic and masculine look. Inside there are zipped pockets and slip pockets as well. The interior also is fully textile lined. 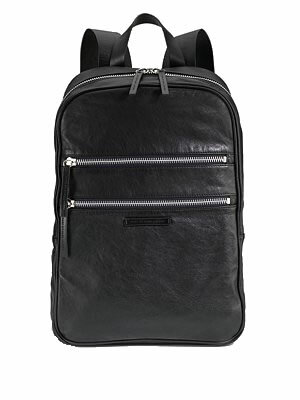 The price for this designer backpack is 428 USD (sold also online). The size is 12.1" X 17.5" and 5.5"
The Marc line offers cheaper price for man bags and you can find some quite attractive messenger bags in canvas in a 200 US dollar price range or buy a leather messenger bag valued around 500 USD. This brand also has durable laptop bags as well.